Haddonfield artist Natalie Italiano is painting a documentary. Her "100 Portraits of American Teenagers" is a kinetic collection of close-ups - on canvas and online - of local high school students. "I plan to do a gallery show and a book as well," says Italiano, 57, whose subjects also write about themselves. Their musings, and digital images of her portraits, can be seen at www.natalieitaliano.blogspot.com. I met Italiano at Repenning Fine Arts in Audubon, a school and studio that has supported the project since she started it in September 2010. Alongside four other painters seeking to perfect their technique, the artist will create a portrait of Natasha Santiago. A senior at the Pennsauken campus of the Camden County Vocational Schools, Santiago is among 20 Camden youths participating in the project through an arrangement with Urban Promise ministries in the city. 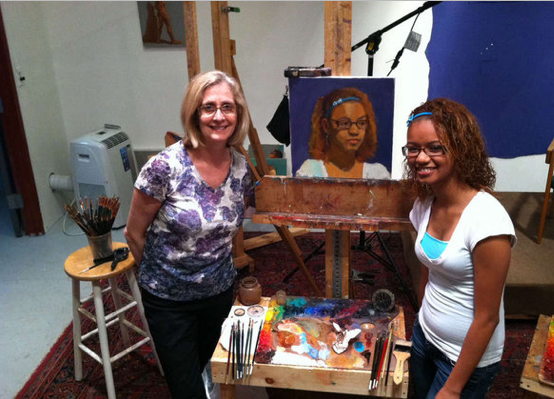 All but three of the other portrait subjects are from suburban high schools in South Jersey. "I'm a little nervous," Santiago, 17, says before taking a seat in a flood of light. "But I think it will be pretty cool." She's right: It's fascinating to watch her face take shape on five canvases simultaneously. The personable, thoroughly professional Italiano sets the pace and an easygoing, though serious, tone befitting a teacher at Studio Incamminati in Philadelphia, an art school founded by the noted Bucks County realist Nelson Shanks. Using the alla prima ("first") technique, she quickly renders the infrastructure, then the architecture, of her striking subject's facial features. Likewise, the brushes of fellow South Jersey artists Carol Kirkwood, Linda Dennin, Donna Metzler, and Adelaide D'Antonio rarely stop moving. Pausing only to step back or squint, they skillfully add dabs of contrasting oil pigments, finding depths, burnishing highlights. As strummy music plays on the painters murmur among themselves, and the vibe in the studio becomes almost hypnotic. As four hours pass, Italiano and her colleagues look deeper at and into the young woman who sits motionless in front of them, transferring their discoveries to canvas in ever tinier, more exacting strokes. It's work, what these artists do. And the model, who gets paid $40, is working, too. Santiago remains poised and focused for each 20-minute stretch. I don't notice a single fidget or shift of position. But at every six-minute break, she leaps out of her chair like the teenager she is. "It's tiring," Santiago says, although you wouldn't know it from the glow on her face. "It's like having someone write a song about you," says Jim Repenning, who, with his wife and fellow artist, Kristin, runs the studio and school on Kings Highway. "You're watching people create their image of you." The project was inspired by a Rose Frantzen show Italiano saw several years at the National Portrait Gallery in Washington. As her own two children were leaving the nest, she got the idea of "doing portraiture, which is often reserved for the elite." Italiano's earliest subjects included friends of her children. At the Acme market in Haddonfield, she discovered four young people willing to model. She found others in classes at Repenning or Incamminati. As she has come to know them all, Italiano says she has been struck by their "warmth and seriousness" - qualities surely at odds with the image of teens as heedless textaholics. She also gives the models a questionnaire, asking them to talk about issues, plans, and what matters most to them. "Despite certain cultural or economic differences," Italiano says, "they all seem to have a really positive view on life." In other words, they have hope. And when I look at the portraits of Natasha, Christian, and Caroline, or of the other glorious young faces among the "100 Portraits of American Teenagers," I have hope, too.